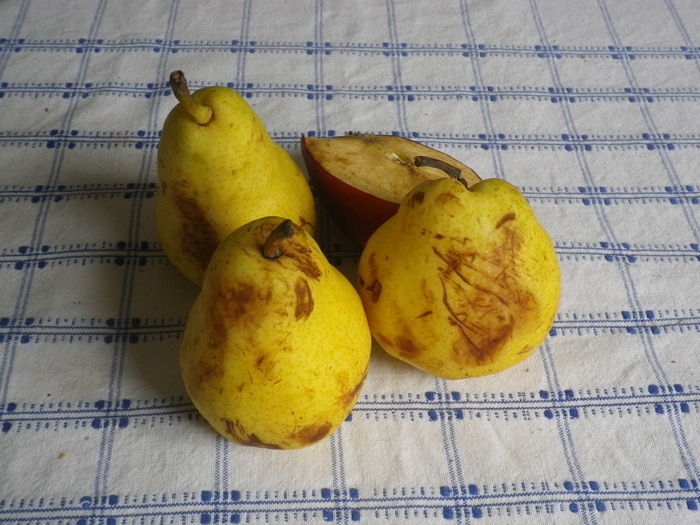 We had bought these very small pears in Foggia, as they were so tiny and pretty. 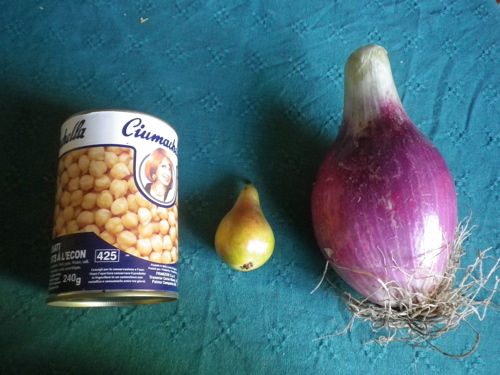 For scale, here is one of the pears with a tin of chickpeas and a very large Foggia onion. 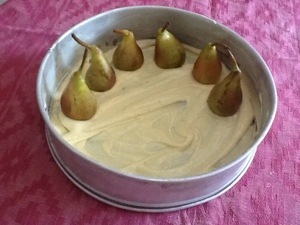 I was planning do bake banana bread today, but the pears needed to be used up. We debated options over breakfast (yesterday’s sourdough bread): perhaps a clafoutis, something where we could showcase the pears whole? Being so small, there would be no need to poach them. Then we agreed that a cake might be nice, something for a quiet Sunday afternoon while my husband is listening to the cricket. 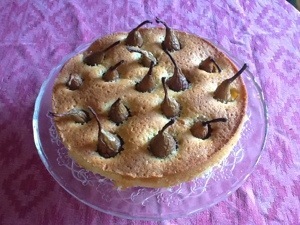 So cake it was: adapted from this recipe in The Telegraph: The new baker: baked whole pear cake from last November. That recipe includes nutmeg, orange zest and rum, with a bit more butter and sugar, and looks just gorgeous. Preheat the oven to 180°C/350°F. Brush base and sides of a 24 cm springform tin with a little softened butter. Beat butter and sugar, add eggs. Add dry ingredients, and rum, if using. Wash and core the pears from below, with a very small paring knife, leaving the pears whole. Make sure they are cut level at base so you can stand them in the tin more easily. No need to peel them. The batter will be quite thick. Spread a couple spoons of batter on the base of the tin, and stand the whole cored pears in the tun. Spoon the rest of the batter carefully in the gaps between the pears. It may look a bit scant, but the batter puffs up nicely while baking. Bake 55 minutes 180°C or so until golden. Cool before slicing. Notes: I had bought vanilla salt from the Mercato Centrale in Florence, where I usually buy smoked salt when up there for a weekend (coffee, market, then bistecca Fiorentina at Trattoria Mario – mmmmm….) This time, the vanilla salt looked interesting too. The stallholder recommended using it on fish, which I haven’t tried yet, but it is great in baking. The Telegraph recipe suggested varying this with stoned apricots or plums, then using cardamon or star anise. 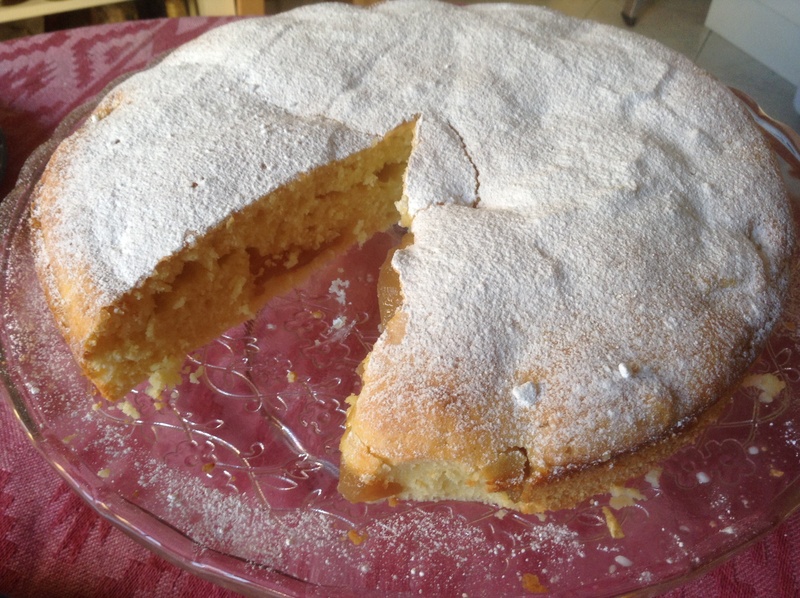 I do like cardamon, and the flavour is strong in this cake even with just 1/4 teaspoon, so you might want to use less. Cinnamon could have been nice too. Halves of larger pears would work as well, though I’d keep an eye on the moisture from the pears, as cut pears might leach more moisture. 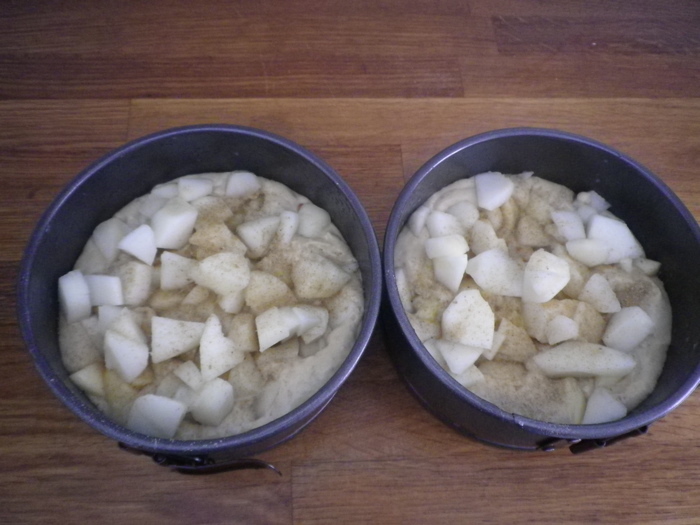 A smaller tin and a bit more batter might be needed to stand the pears in. 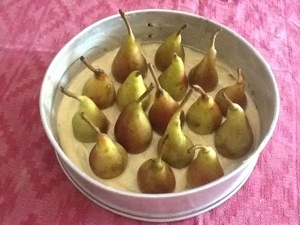 This entry was posted in baking, food, fruit and tagged cake, cardamom, nice cup of tea, pears on July 14, 2013 by krumkaker. I’d planned to make lemon drizzle cake today, but had a change of plans. We bought pears last week, and some have been languishing in the vegetable drawer of the fridge a bit too long, as you can see. And a forgotten half apple turned up as well. Clearly a pear cake of sorts was called for. 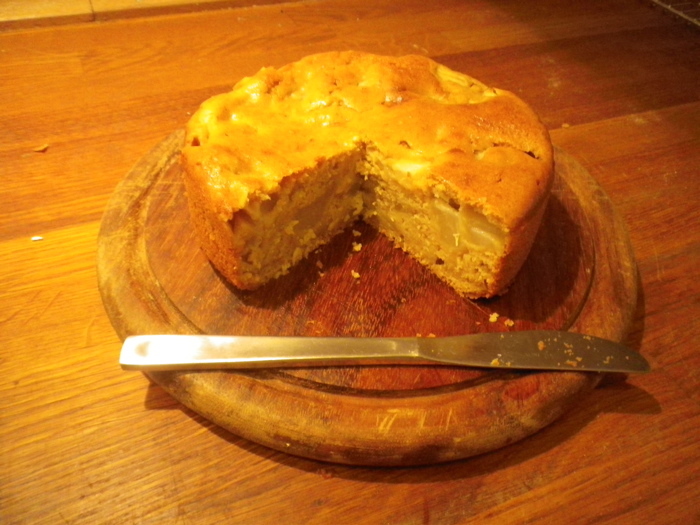 I looked up my collection of apple + cake + yoghurt recipes, and found a promising one on Cook Almost Anything. 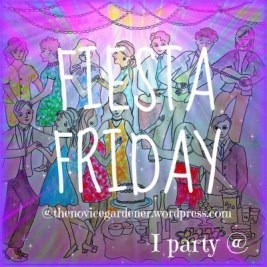 Instead of one cake I baked two smaller ones, so one can be sent off with friends. 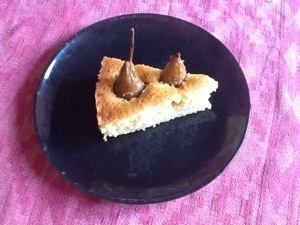 I thought it might be a bit dry, but the pears were so juicy that the cake is very moist anyway. It doesn’t feel too virtuous! Line two small springform cake tin (15 cm each) or one springform cake tin (22 cm) with baking paper. Beat eggs, white sugar and brown sugar well. Mix in the yoghurt, then the flour (white and wholewheat), the salt and baking powder and vanilla sugar, and finally the cooled melted butter. Pour half of the batter into the cake tin. Sprinkle on chopped pears, push into batter. Optional: sprinkle this layer with cardamom (cinnamon could be nice too), then top with rest of cake batter. Bake at 180°C oven until golden on top and cooked through – about 40-50 minutes if using the small tins, depending on your oven. About 60 to 75 minutes if using the larger tin. Notes: From the original recipe, I swapped the apples for pears, reduced the butter by 25%, reduced the sugars by 25%, and used 20% wholewheat flour. The original recipe called for self-raising flour, but I used plain 00 flour and 1 teaspoon baking powder per hundred grammes of flour. 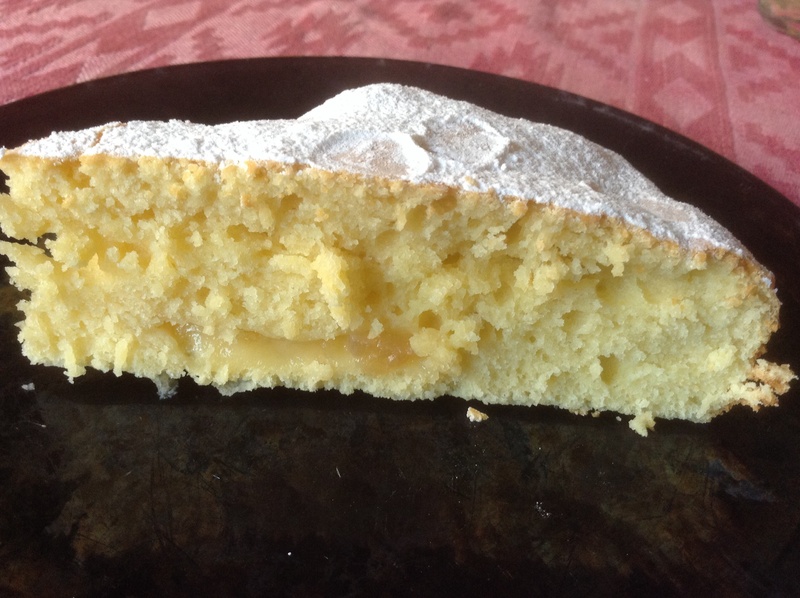 This entry was posted in baking, food, fruit and tagged cake, cardamom, pears on May 4, 2013 by krumkaker.